Ceramic tile makes an attractive addition to any room of the house. Most often found in kitchens and bathrooms, ceramic tile can also be used to decorate ceilings, showers, bathtubs, countertops, flooring, walls, and even outdoors. Decorative ceramic tile is also one of the most versatile design elements for an interior designer or decorator. The range of colors, multitude of textures and shapes, and infinite design possibilities available with decorative ceramic tile makes it possible to fashion almost any ambiance or atmosphere. The flexibility and versatility of ceramic tile allows designers and homeowners to get more imaginative with tile in kitchens and bathrooms. There are conventions about scale and layout in ceramic tile design, but these rules are being broken and interior designers and decorators are increasing pushing the envelope of ceramic tile patterns and mosaic tile designs. The blending of textures is the newest fashion trend in ceramic tile design. Using natural stone with glass mosaic tile, ceramic porcelain tile with natural stone, maybe a matte stone finish next to a glossy glass tile finish. Another emerging trend is bringing together a number of dissimilar textures and finishes with a monochromatic color scheme. Interior designers and decorators also appear to be trending away from smaller ceramic tiles and toward larger tile sizes 16x16s and 18x18s. Larger ceramic tiles craft an entirely different impression. Using larger ceramic tiles means fewer grout lines, which makes an interior space appear more expansive and open. Although Mexican ceramic tile and earth tones are still popular, ceramic tile design and colors are getting richer. The fashion trend now is a more urban, modern look. Interior designers, decorators and consumers are moving away from white and beige Italian tile in the direction of darker, deeper colors. Tile has always been enormous market in Europe, especially Italian ceramic tile, but now Americans are beginning to be aware of its possibilities as both a design element and a functional building material. Its design flexibility allows homeowners and consumers have the ability to express themselves and distinguish their environs. Areas of the home must be considered individually. 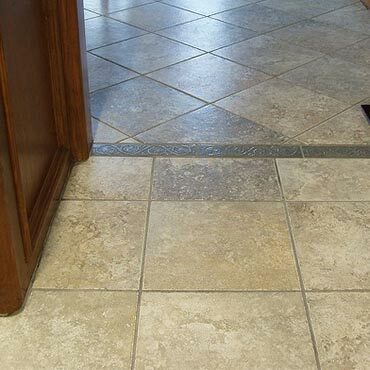 Areas of the home that have everyday use, such as kitchens, family rooms, and areas where chairs or equipment are often pulled across the floor, will need a ceramic floor tile with good abrasion resistance. Flooring with direct entrance to the outside will be subject to tracked-in soil, sand or water. These areas of the home will necessitate superior abrasion resistance as well as a reasonable amount of slip resistance. For areas of the home used less frequently, such as living rooms, dens and sunrooms, most products are appropriate. In bedrooms and baths, traffic is normally light and footwear is rarely worn, so any ceramic floor tile may be selected. Areas that are used while wet, including shower floors, saunas and hot tubs, require tiles with low water absorption and excellent slip resistance. Some of the other important things when selecting tiles besides abrasion resistance and slip-resistance are the size and color of the grout joints, the thickness, height variations from room to room, size, suitability of the sub-floor, and cleanability of the tile.